Strengths: Slava Kozlov is a gifted forward with a deceiving shot and excellent playmaking abilities. He brings leadership to his team and is effective in both offensive and defensive situations. Weaknesses: He is prone to cold streaks when he goes stretches of games without a point. With age, Kozlov’s physical play and production are declining. Biography: Slava Kozlov was born in Voskresensk, an industrial town outside of Moscow, also where Igor Larionov hails from. Kozlov was taught hockey by his dad from the age of five. Ten years later, Kozlov already played for the local team Khimik. He was a star player and behaved like one, winning the Soviet Rookie of the Year award in 1990. After joining the Central Red Army team in 1991, Kozlov got into a car accident that changed his life forever. Teammate Kirill Tarasov was left dead, while Kozlov suffered a fractured skull and a broken cheekbone and ribs. He spent three months in hospital, but was then courted by the Detroit Red Wings. CSKA was not willing to let go of Kozlov, so the matter was taken to court. Eventually, Slava joined the Red Wings at the end of the 1991-92 season. Playing in the NHL was considerably more challenging, as Kozlov was frequently victimized by hard hits. However, he managed to become a very effective playmaker. 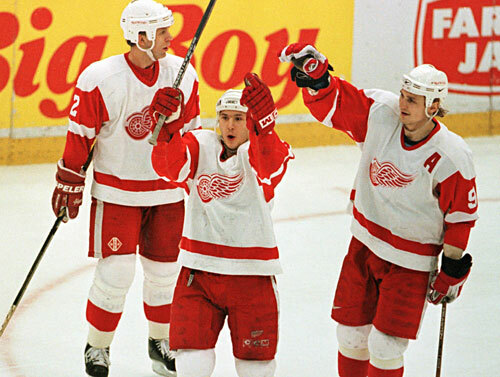 In 1995, he scored the goal that put his Red Wings into the Stanley Cup Finals for the first time in 29 years. 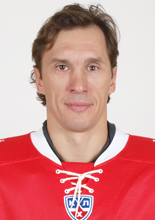 Kozlov won the Cup with Detroit in 1997 and 1998. With Igor Larionov, he brought it to their hometown of Voskresensk. 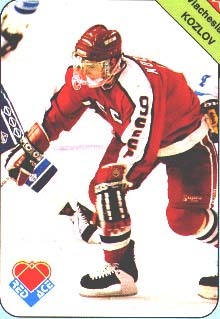 In 2001, Kozlov was traded in exchange for Dominic Hasek. He left Detroit as their all-time playoff game-winning goal leader. In the middle of a hot streak with the Buffalo Sabres, Kozlov severely injured his Achilles tendon, requiring sixty stitches. The next season he played in Atlanta, setting a career record for assists and mentoring rising star Ilya Kovalchuk. In 2004-05, Kozlov first played for his hometown Khimik in Russia before joining the star-studded Ak Bars Kazan. After the NHL lockout, he continued to a leader on the Thrashers and in 2006-07 had his best season, helping Atlanta clinch their first ever playoff berth. Kozlov continued to play at a high level in the NHL until 2009-10, when he missed a third of the season to injury. In 2010, Kozlov returned to Russia for his third stint with CSKA Moscow and was transferred to Salavat Yulaev mid-season. In 2011, he signed with Dynamo Moscow. Kozlov had a limited presence in the 2012 playoffs, but Dynamo did win the Gagarin Cup as the KHL champions. In 2013, Kozlov joined Spartak Moscow.